We must be at hotel hall at 8 AM to join the city tour. 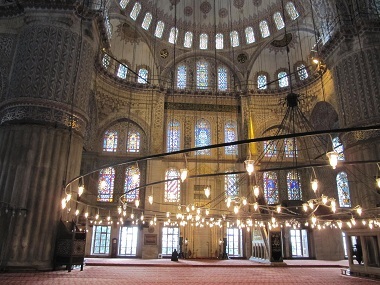 It is planned to visit the Blue Mosque, Hagia Sofia, Basilica Cistern and Topkapi Palace. At 8 o’clock leaves the bus which drives us to the most touristic part of Istanbul, crossing Galata Bridge to South on its way. I could get some time to spend at Great Bazaar on Friday but I’ve not been able of seeing more from the city since then. The windows are showing a city over a bunch of hills full of mosques with their protruding minarets creating an exotic skyline. We go down in what is known as Hippodrome of Constantinople because this place was used for horse racing when the city had that name, but now is difficult to reckon it here. It is a kind of long and narrow square with two obelisks marking where the 180º curves of the circuit were sited. One of them is Egyptian and the other one is Roman. The obelisk built by Emperor Constantine is the bigger and uglier. It is known as the walled obelisk and, as the only it can show is old and broken bricks, it is logic the tourists pay more attention to the small, but polished, and hieroglyphic written obelisk of Thutmosis III and its white marbled pedestal with its grabbed Roman images. 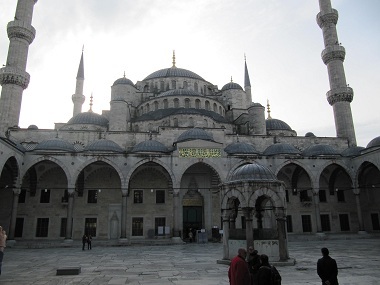 Now it’s time for the Blue Mosque, which majestic outside we can see from hippodrome. There are three minarets on both sides, six in total, and the whole building looks fantastic, with special mention of its several blue vaulted roofs and the golden framed messages, undecipherable for us. 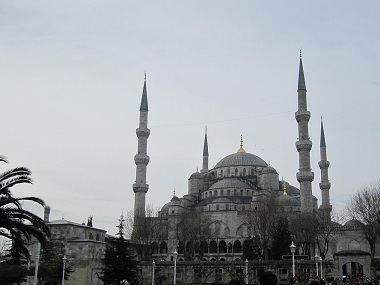 Its real name is Sultan Ahmed Mosque, though. When we’re taking our shoes before get in due to you cannot use footwear on any mosque, I can see a special place where the people can clean their feet. In this specific mosque we are given simple plastic bags for carrying our shoes on hand while we’re inside. Once inside I can understand the reason for the no-shoes rule: the whole floor is carpeted and is the place for praying. Shoes can get dirty the spot where a prayer can put his forehead. On another hand, the place looks spectacular from inside. The lamps are surprisingly big and low, while they’re hanging with some very long wires on the deep of the higher domes. Leaving the mosque I can find a dog sleeping peacefully on one of the courtyards. This is a typical scene of this city and we’re finding dogs resting in any place of the street. There are a lot of cats too, which seem to share the street in peace with the dogs. 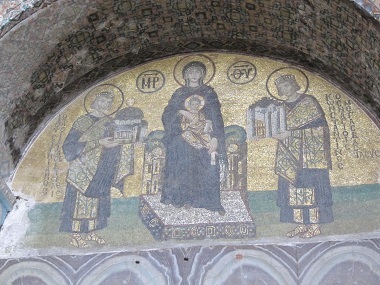 As next building we can find Hagia Sofia. There is only a small park between the mosque and what once was one, it was a basilica too and now it is a museum. It looks like a mosque from outside and like a church from inside, but what stands out while approaching to it is its red color, which comes from the bricks it is made with. These bricks are more obvious in a closer look. Actually, it disappoints a little bit: on one hand it looks more like a building needing for improvements than the main monument of the city and, on another hand, it loses any comparison with its neighbor Sultan Ahmed Mosque. There are rests of columns and lintels around and, in general, it looks kind of messy. I think it could be related with the fact it has been a catholic temple and not a mosque anymore. 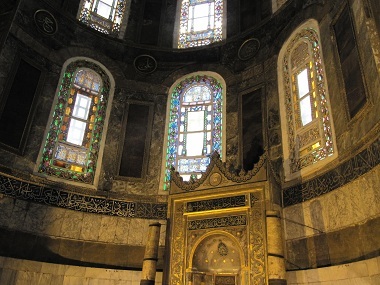 Inside we can see a mosque which big lamps and Islamic signs has been removed and exchanged by paintings and mosaics with Christian images. 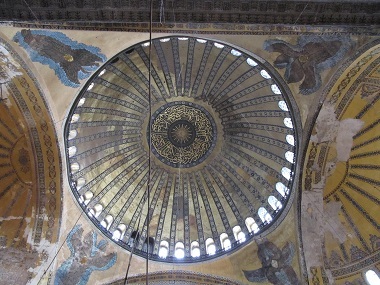 In order of being fair with Hagia Sofia, we must say it is spectacular, the highs inside twist napes and the yellow and golden shades are in invasion. It would be really wonderful if it could avoid be compared with Blue Mosque, although this is some centuries older. 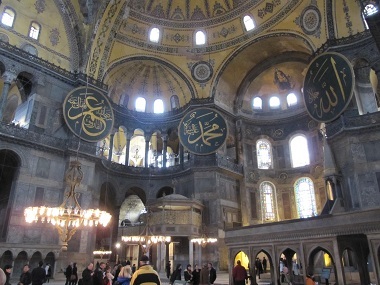 Actually, being the first is important on the history of this place because, as our guide has explained, Sultan Ahmed Mosque was built with the purpose of outshining Hagia Sofia. We take a different door for our exit in order of being driven to our next visit, which is located just across the street: Basilica Cistern. 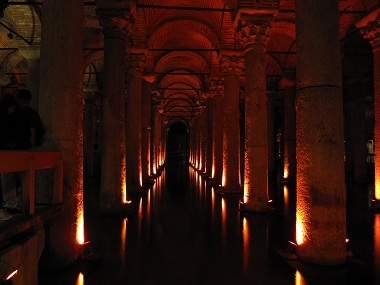 You cannot see anything special from outside here but inside it is a surprising place: hundreds of columns sited forming a big matrix are emerging from waters, which you can only sense because of the flickering lights reflected on them. These lights are the only thing avoiding the complete darkness. It is like a big flooded hall. This place is called “Sunken Palace” too, a suggestive name for using on touristic vouchers. Its purpose was, obviously, storing water and this visit stimulates the smell as sight and hearing are quite reduced here . A system based on gangways allows the visitors crossing the hall and accessing to remote corners as the one written in signs as “Medusa heads”. 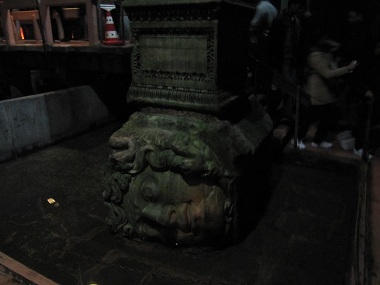 They’re two strange blocks of stone with women’s heads as column bases, one is sideways and the other one is upside down. As they’re on the base of a column, it feels like if all was inverted. 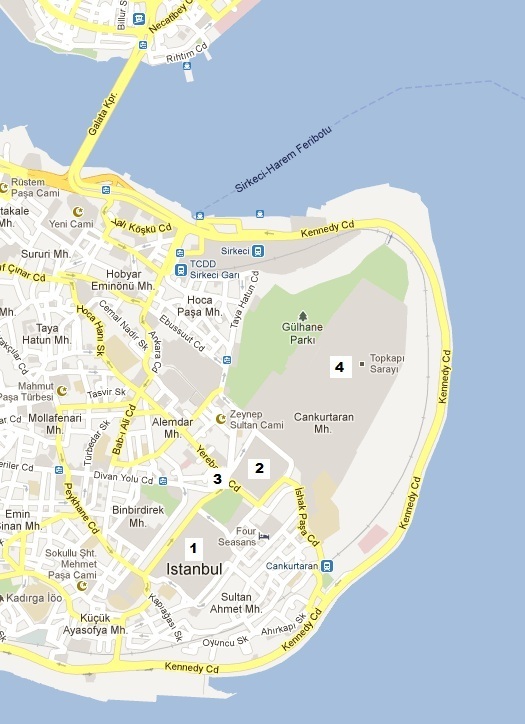 It’s moment to go to Topkapi Palace, which is close too. All these visits can be done by walking just a few meters between one and another. We start by passing through The Imperial Gate and get into a park limited by walls with these bricks we could see in Hagia Sofia, and these serrated borders the castles use to have. 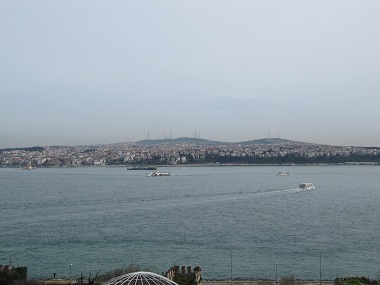 The sight is opened to Sea of Marmara on some parts and we can see the coast in front, across Bosphorus Strait, which separates the city, the country and also two continents. This area is full of cats living freely around. The straight path takes us to The Gate of Salutation, which is the door to a sort of palace courtyard, with a garden, smaller than the previous one. The name of this place is as basic as “Second Courtyard”. We’re coming from the “First” one. The Gate of Felicity gives us access to… guess what?, yes, “Third Courtyard” which it looks more like we’re in a palace, with marbled floors and walls full of doors to inside palace buildings. This is a very clean, well preserved and beautiful place. When going throughout the Audience Chamber, our guide explains what we can see here, and it seems to be a lot. We focus on the different rooms hosting the Imperial Treasury. We get free time to spend as we want; the plan then is going to first room and checking everything inside until exiting by the last one. We’re not allowed of making photos on any of these chambers. The armors are excellent, as well as the dresses, they’re tunics with an unusual width, except for some small pieces which are supposed to be for Sultan’s sons. They’ve got beautiful embroidery, but just on small parts of the robe. The treasury is really spectacular, a vast collection of objects fully decorated with gemstones, mainly diamonds and emeralds. Somehow, the last chamber has in display a collection of suspicious objects. They’re relics from religious icons and would be completely amazing objects if they’re real, but I ‘m afraid even the same Turkish people do not believe in their authenticity and that would be an explanation of the no publicity about Muhammad’s hair or footprint and even the Staff of Moses. But yes, on the exhibition, these objects are presented as genuine. 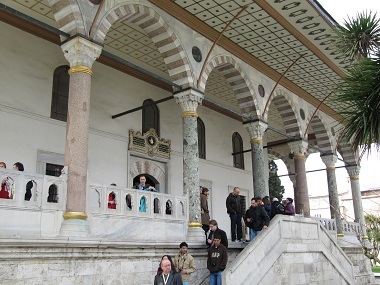 The rest of the time – just a few minutes – we go to the Fourth Courtyard and to the end of the Palace where, besides a snack bar, there are open views to Sea of Marmara on that edge of Bosphorus. There is a constant traffic of boats here and they can be seen just before the Asiatic shore. At the far right we can see the bridge between two continents. These views are a beautiful end to this morning dedicated to know a great city full of history. Istanbul has still a lot of centuries in front to match the achievements of its previous name: Constantinople, which even was the capital of Roman Empire for some centuries.